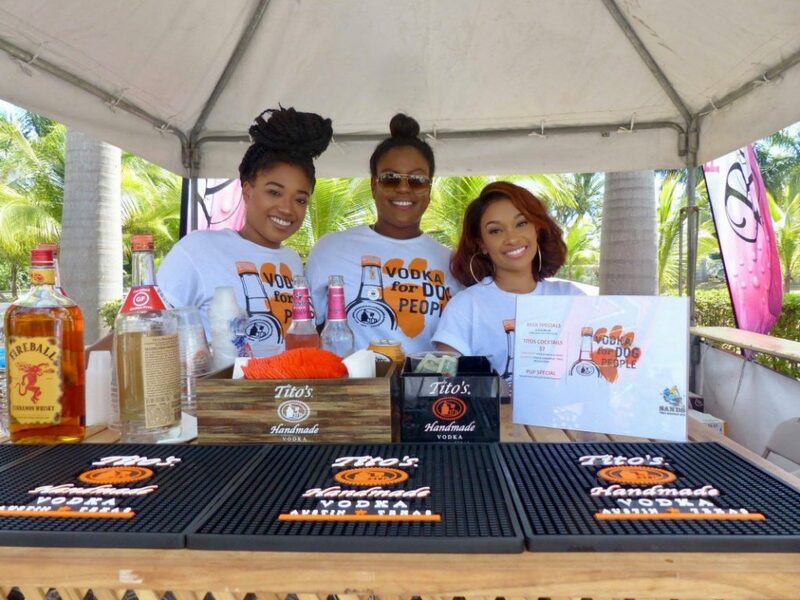 Nassau, Bahamas – Tito’s Handmade Vodka and Bahamian Brewery & Beverage (BBB) Company Ltd., continued their philanthropic efforts by proudly sponsoring The Bahamas Kennel Club’s (BKC) 38th Annual International Dog Show, recently held at the Collins House Grounds, in Nassau. BBB is the official distributor of the very popular brand, Tito’s Handmade Vodka in The Bahamas. Tito’s is infamous for its passionate support of nonprofit charities, through its “Love, Tito’s” initiatives. Every year, the brand carefully screens and selects nonprofit organizations in countries abroad to financially assist. This year the company chose to support the Kennel Club Dog Show, and donated funds whose proceeds aid The Bahamas Humane Society. In addition to the financial contribution to the event, Tito’s also passed out “Vodka for Dog People” t-shirts and more than 200 dog supplies; such as leashes, collars, scarves, food, and water bowls at the Show. In February, CEO, Bert “Tito” Beveridge and over 170 visiting ‘Team Tito’ employees, travelled to Nassau and logged more than 897 hours helping nonprofit organizations. During their visit, Team Tito’s worked at The Humane Society, grooming animals, walking dogs, cleaning shelters, and assisting with other volunteer work. The team also participated in a cleanup campaign with Bahamas Reef Environmental Educational Foundation (BREEF), removing plastics and debris at Saunders Beach and Clifton Heritage Park; worked on the new playground construction project at Centreville Primary School with Playground Ideas, and assisted The Bahamas National Trust with removing invasive species from the soil, that were crowding out native species. BBB and Tito’s Vodka will continue to support nonprofit organizations throughout the year. Tito’s has committed to sponsoring the Bahamas Alliance for Animal Rights and Kindness (BAARK) monthly “Quiz Night”, at the Green Parrot Bar & Grill. Proceeds from the “Quiz Night” will support BAARK’s ongoing Spray and Neuter Program and the BBB continue to help the BNT’s fundraising events. For more information on Tito’s Handmade Vodka charitable endeavours, visit the company’s website – www.titosvodka.com/love/ and watch the video of their trip to Nassau – https://youtu.be/nwSBXvtTQbc.